Brazil: Henry Campos, M.D., M.Sc., Ph.D., Professor of Internal Medicine and Vice Rector, Universidad Federal do Ceará, and Co-Director of the Brazil-FAIMER Regional Institute. Dr. Campos represented both the government and health professions education points of view. FAIMER’s Associate Vice President for Education and Co-Director of the FAIMER Institute, William Burdick, M.D., M.S.Ed., encouraged participants to explore pragmatic strategies for aligning government and health professions education to address health care challenges, especially those involving faculty development and capacity building. Ideas included setting up low-risk meetings between education and government officials to encourage dialogue; pooling resources and exploring opportunities for joint funding of needed programs; using FAIMER Regional Institutes as a meeting ground for stakeholders; integrating the training of different types of health care workers; training health care workers at the local level; and aligning academic research, data gathering, and data presentation with the requirements of government to obtain funding and support for needed programs. An important theme throughout the discussion was that a common vision for health care improvement, shared by government and health professions education, can drive change and bring about needed improvements. In addition to the representatives from the four focus countries, participants in IME Day included Fellows and faculty of the 2008 and 2009 FAIMER Institutes, staff members from FAIMER and the Educational Commission for Foreign Medical Graduates (ECFMG), and other guests, including ECFMG President Emeritus and FAIMER Senior Scholar James A. Hallock, M.D. ; Director of the Division of Graduate Medical Education of the American Medical Association, Paul H. Rockey, M.D., M.P.H. ; and FAIMER Directors Philip L. Gildenberg, M.D., Ram R. Krishna, M.D., Donald O. Nutter, M.D., and Sharon Wood-Dauphinee, Ph.D. Feedback from the day was very positive. Participants were impressed by the range of ideas that could be generated in a single day through focused, cross-cultural exchange. In a closing panel discussion, the representatives from the four countries each expressed gratitude for the opportunity to learn different approaches from the others, which they could take back to their own regions and use to improve the coordination of government and health professions education in efforts to improve health care. Fellows of the 2009 FAIMER Institute meet in Philadelphia. 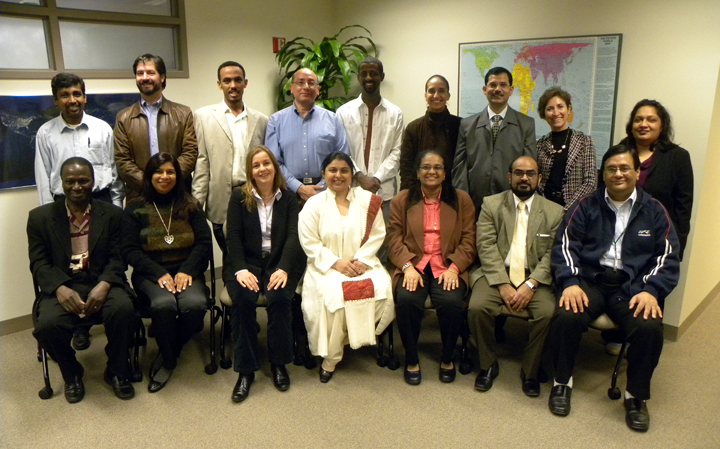 Sixteen international health professions educators who represent academic institutions from 11 countries around the world arrived in Philadelphia on October 3, 2009, to begin their first session as Fellows of the 2009 FAIMER Institute. The FAIMER Institute fellowship program is designed for international health professions educators who have the potential to play key leadership roles at their schools. The program serves two main purposes: (1) provide participants with the tools and skills to serve as resources for their individual institutions, and (2) create an environment for cross-cultural exchange of educational expertise and experiences. The ultimate goal is to improve the health of local communities through local and regional improvements to health professions education programs. On October 18, the 2009 Fellows were joined by the 2008 Fellows, returning to Philadelphia to complete their final residential session. These opportunities for interaction between classes of Fellows support the development of a community of international health professions educators dedicated to the improvement of health professions education and the health of communities. In addition to the new Fellows, the FAIMER Institute also welcomed new faculty member James BonTempo, Learning Technology Advisor for Jhpiego, an affiliate of Johns Hopkins University that develops “effective, low-cost, hands-on solutions to strengthen the delivery of health care services for women and their families.” Mr. BonTempo’s teaching interests include tools and channels for distance learning. Returning to the Institute as faculty members were James A. Hallock, M.D., President Emeritus of the Educational Commission for Foreign Medical Graduates and former Chair of the FAIMER Board of Directors, and Dale Dauphinee, M.D., former Executive Director of the Medical Council of Canada and professor at McGill University. 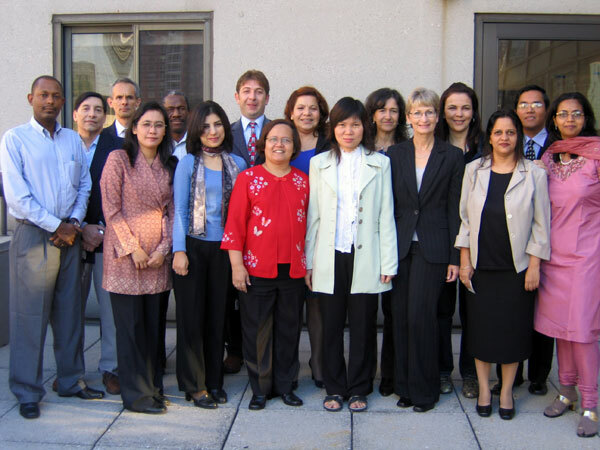 Sixteen international health professions educators who represent academic institutions from 14 countries around the world arrived in Philadelphia on October 5, 2008, to begin their first session as Fellows of the 2008 FAIMER Institute. The FAIMER Institute fellowship program is designed for international health professions educators who have the potential to play key roles at their schools. The program serves two main purposes, to: (1) provide participants with the tools and skills to serve as resources for their individual institutions and (2) create an environment for cross-cultural exchange of educational expertise and experiences. The ultimate goal is to improve the health of local communities by improving health professions education programs. The program helps Fellows develop curricula appropriate to their own schools and communities. At the end of October, the incoming Institute 2008 Fellows were joined by returning Institute 2007 Fellows as they completed their final residential session. When the 2008 Fellows complete their final residential session next year, they will meet the incoming Institute 2009 Fellows. These opportunities for interaction between classes of Fellows support the development of a community of international health professions educators dedicated to the improvement of health professions education and the health of their communities.